Wouldn’t it be great if your clients told you exactly how much they trust you? What would you do with that information? How would it help you help your clients? Would they be more likely to follow your advice? How would that impact their success and yours? I believe your clients are telling you how much they trust you with the most effective and predictable communication method that exists: behavior. Ralph Waldo Emerson’s famous quote applies here, “What you do speaks so loudly that I cannot hear what you say.” What your clients do, or do not do, is speaking loudly about trust. Are you listening? 1. How receptive to comprehensive financial services and advice are each of your clients? 2. Have they consolidated all of their business with you? 3. Do they act on your advice with relatively little “selling” or the need to use “persuasion” or “closing” techniques? 4. Are they more influenced by your advice than the negative emotions related to market, economic, political or world events? 5. Do they pay your fee without quibbling or haggling? 6. To what degree do they either offer unsolicited referrals or respond positively when you ask them to introduce you to their friends, family and colleagues? If your clients have an imaginary trust dial embedded in their subconscious, and they do, where does the needle on that trust dial have to be so your clients trust you completely? And if you are dealing with spouses or partners, keep in mind that there are two separate trust dials at work. Would you like to have clients who are fully comprehensive, consolidate all of their business with you, act on your advice, are more influenced by your advice than negative world events, happily pay your fee and consistently introduce you to their friends, family and colleagues? The key is trust. Most of what’s involved in building trust is within your control. It’s also helpful to keep in mind that some people can’t trust. Establishing trust with someone who can’t trust is like trying to teach someone with a morbid fear of sharks to surf. Even if it’s possible, it’s not worth the time. This also has little to do with how trustworthy you are. For the sake of this article, I am going to assume that you are trustworthy from both the competence and character sides of trust. I’m sure you find it frustrating to be trustworthy and have some people not trust you. Trust is for them to decide about you, not something you can declare. 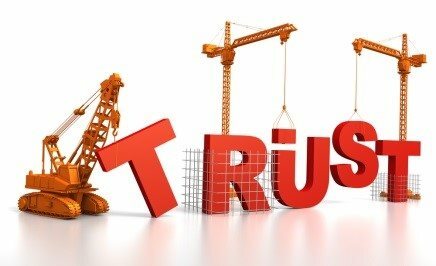 The truth about how much each of your clients trusts you is a simple, honest assessment by you and your team of all six metrics of trust for each of your clients. How does that work? Let’s take the first metric. What are your clients telling you if they look to you for advice in all areas of financial services? What does it say about how much they trust you if they only do business with you in one area of financial services, say investments or insurance? It could be as simple as you are not clearly communicating everything you can do for them. Or is it that they trust you enough to do some business with you, but not enough to work with you across all areas of financial services? Your clients’ willingness to be engaged in a holistic relationship vs. a la carte transactions is a metric of how much they trust you. What is their behavior in this area telling you about how much they trust you? On a scale of 1-10, what’s the score? Having multiple advisors is not diversification. Metric No. 2 means that when your clients have their money spread among several advisors and institutions they are sending the message that they don’t trust any of you enough. You know your clients trust you completely when they have consolidated all of their investments with you. Consolidated doesn’t necessarily mean that all of their money has been transferred into an account at your firm. What about the money they have in places where it can’t be transferred into those accounts? Does that money still fall under your advice and are they willing to pay you for that? What is their behavior in this area telling you about how much they trust you? On a scale of 1-10, what’s the score? I’ve seen research about how wealthy people having their investments spread among several advisors. Institutions used to justify that this is just how wealthy people “are,” it’s not changeable, and you should be happy with a good-size account even if it’s only a part of what they have. This is ridiculous. The much better lesson, and the good news for you, is that they have not yet met someone they trust enough to consolidate all of their money with one advisor. Why couldn’t that person be you? Wealthy people value simplification. Is it simpler to have multiple advisors and institutions even when that doesn’t add any value? Will you become the person they trust enough to consolidate all of their assets with? Or will that be someone else? The third metric is how readily they act on your advice. Have you ever given someone advice and without any hesitation they said, “OK.” That’s trust. Even the most analytical people are capable of trusting at this level. The more you are trusted, the more quickly your clients act on your advice with less information, education or discussion. If you feel like you’re “closing,” the trust level is low. What would have to happen for you to become the advisor who exudes that level of trust? What is their behavior in this area telling you about how much they trust you? On a scale of 1-10, what’s the score? The fourth metric is the degree to which your clients are more influenced by you than they are by all the negative events in the world that are very effectively exaggerated, embellished and spun by smart and articulate people who deliver the “news.” When the crap hit the fan a few years ago, did your clients stay the course of their plan or did they make you sell low, against your advice? What has to happen to move the needle on the trust dial so your clients are more influenced by you than their emotional reaction to events out of their control? What is their behavior in this area telling you about how much they trust you? On a scale of 1-10, what’s the score? The fifth metric is about your compensation. First of all, is ALL of your compensation totally transparent and fully disclosed? Are ALL of the costs of doing business with you totally transparent and fully disclosed, not just the money that you get paid? And are they happy to pay whatever that is? If there is debate about your fee, it could mean more than just a cheap client. There could be a trust issue at work. When that needle on the trust dial moves farther to the right, your clients will be happy to pay the fee, provided, of course, there is a good value. What is their behavior in this area telling you about how much they trust you? On a scale of 1-10, what’s the score? And that brings us to metric No. 6: referrals. I think it’s reasonable to believe that your clients have to trust you more to refer you to their friends, family and colleagues than the level of trust required for them to do business with you. A referral and introduction puts their most important relationships at risk. If you drop the ball, it reflects badly on them. So, do they refer you? How involved are they willing to be to make a warm introduction? Obviously, there’s a significant trust difference between, “Call so-and-so, but don’t use my name” versus “Give Bob a call later this week after I have the chance to speak with him and tell him how much I trust you and what a great job you have done for me.” And don’t believe it for a moment if you ever hear, “We just don’t refer.” That’s not-very-encrypted code for, “I don’t trust you enough to risk my relationships with my friends, family and colleagues to make those introductions.” Your mission, should you decide to accept it, is to be trusted that much. What is their behavior in this area telling you about how much they trust you? On a scale of 1-10, what’s the score? Now what? How do you use this information to become a better advisor for your clients and a more successful advisor for yourself and your family? The first step is an assessment to discover the truth about the level of trust that exists with your clients based on their behavior against these six metrics. Essentially, the way it works is that you enter the name for each of your clients and assess where they stand in each of these six areas. Using a simple 1-10 scoring system, your trust score with that client could be a maximum of 60. It will be very apparent where you want to improve your value delivery or strengthen the relationship to move the needle on the trust dial to where both you and the client would prefer it to be. Make it your goal to become the kind of advisor and communicator who can move the needle on the trust dial to create a clientele who are fully comprehensive, consolidate all of their business with you, act on your advice, are more influenced by you than negative external events, happily pay your fee and consistently introduce you to their friends, family and colleagues. Advisor Practice Management partners with Bill Bachrach to help you improve your “People Skills” so you attract better clients, implement full financial planning with prospects and clients, generate higher planning fees (up-front & ongoing), gather more assets, inspire clients to more quickly act on all your advice to fully implement their plans, and get more referrals. Join Grant Hicks and Bill Bachrach in San Diego this fall and attend the next People Skills Workshop, 2016 at a special Advisor Practice Management reduced tuition. www.peopleskillsnetwork.com and use promo code APM1K.